(UPM Raflatac, Helsinki, 14 February 2019 at 11:00 EET) - UPM Raflatac is expanding its portfolio of solutions for wine, spirits, and craft beverage labeling with the introduction of RH30, a new high-performance hotmelt adhesive that brings significant benefits for label converters and brand owners alike. 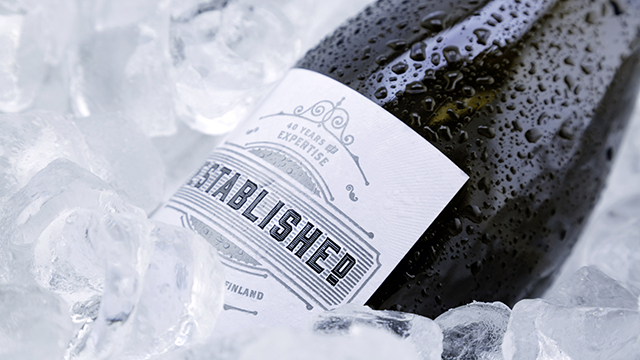 RH30 combines excellent high-speed converting and dispensing properties with the reliable adhesion and moisture resistance needed to keep labels firmly in place and looking good for the lifetime of the product - even in ice-bucket conditions. "The wine, spirits, and craft beverage market is a highly competitive field where the label plays a key role in attracting the consumer and telling a brand's story," says Jay Betton, Segment Manager, Wine, Spirits & Craft Beverage, EMEIA. "RH30 is specifically designed to make hotmelt conversion faster and smoother while also providing brand owners with a high-performance labeling solution that keeps products looking their best for their entire lifetime - from the store shelf to the ice bucket."